Reports of unidentified flying objects in the skies over the province of Ultima Esperanza began to emerge in the month of September of this year, causing a blend of curiosity and fear. 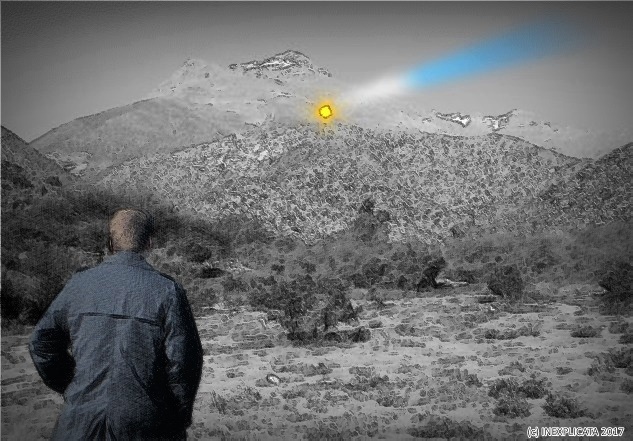 Patricio Frias, a representative for UFO Noise Patagonia (a body devoted to researching anomalous phenomena), stated that a light had been reported on 9 September 2017 in Sierra Dorotea, suspended halfway up the mountain and emitting bright flashes in broad daylight. The foregoing was witnessed for about 10 minutes by witnesses in the Camino Tres sector of Huertos Familiares. 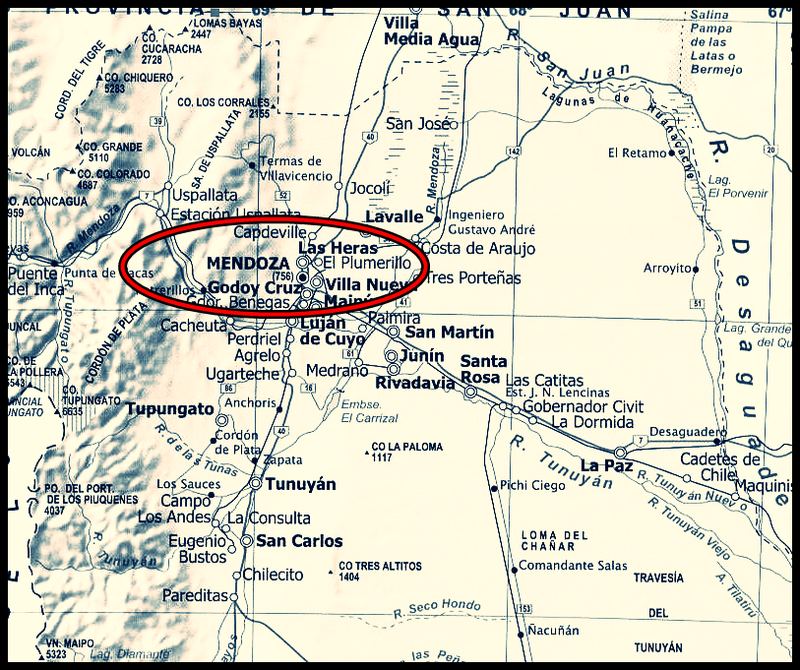 On 28 September, an inter-provincial bus driver witnesses and alleged craft in the Camino 4 sector of Huertos Familiares, northwest of the city of Puerto Natales. The vehicle allegedly made a close flyby of the bus before speeding off toward the north. In this case, the witness managed to take three photographs showing the object's maneuvers. Finally on Wednesday, 18 October at around 23:00 hours, witnesses in Camino 4 of Huertos Familiares saw a light toward the Teniente Julio Gallardo airport. The particulars of these events are being analyzed in Santiago by the AION group led by renowned researcher Rodrigo Fuenzalida. Patricio Frias noted that "there is an increase in phenomena of this sort around this time of the year, and we call upon the community to be on the lookout and forward any information to our attention at andcultura@gmail.com, whether it involves reports, photographs or video evidence." Persons interested in these matters can explore it more fully at the ufologist's "Realidades del cosmos" Facebook page. Moreover, stories from those who have experienced phenomena of this sort can be heard on the program broadcasted on Wednesdays from 22:00 hours on Viento Sur radio. 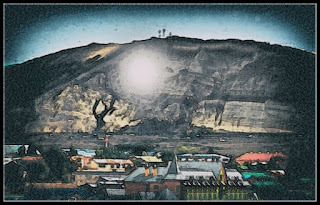 Chile: "Patagonia is Being Visited by an Intelligence We Cannot Understand"
These were the words spoken to TS-Digital by Patricio Frias, director of UFO Noise Patagonia. 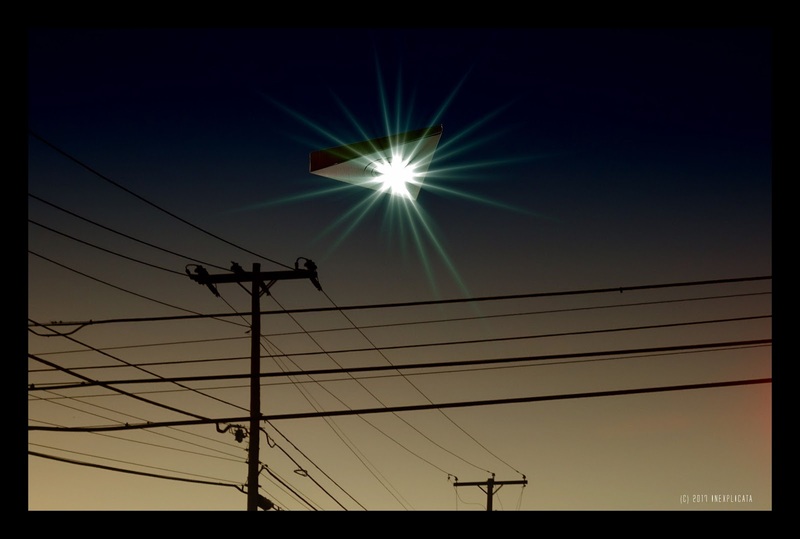 His group is devoted to the study and diffusion of the subject of UFOs in the region. In an interview, he explained the area is 'visited' by entities due to its high electromagnetic energy and mineral deposits. Patricio Frias is a regional ufologist and director of the UFO Noise Patagonia organization, a group responsible for collecting reports and disseminating cases involving sightings of Unidentified Flying Objects as well as manifestations, chases and encounters involving these "entities". TS-Digital interviewed Frias, who explained the nature of his work for the organization and why the region boasts some of the highest numbers of sightings. He noted that "Patagonia is visited by an intelligence we cannot understand", while explaining that the phenomena occur due to the large amount of water and mineral reserves. As documented by UFO Noise, at least 150 anomalous events have taken place in the region. TS-Digital asked why such considerable numbers of sightings occur in Patagonia, featuring such locations as Laguna Azul, which has aroused curiosity and been the source of myths and legends. "There is a biosphere reservation. This sight concentrates the greatest quantity of minerals and fresh water," he explained, stressing the areas. He maintains that many witnesses have seen lights descending into rivers and lakes to draw out "fluids that are essential for life in the Universe." 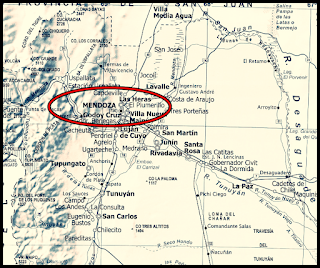 Coal is produced in localities close to Puerto Natales or Rio Turbio, twin cities. There are places and geographical areas containing great mineral wealth and it has been ascertained that electromagnetic transmissions occur there," said UFO Noise's director. When asked specifically about Laguna Azul, he replied with an anecdote that had reached this community from a traveler. "They told me that considerable energy is produced in the spot where the phenomenon occurs. I have been told about the presence of humanoid species in the area. A townsman from Natales was driving along in his truck, frightened. 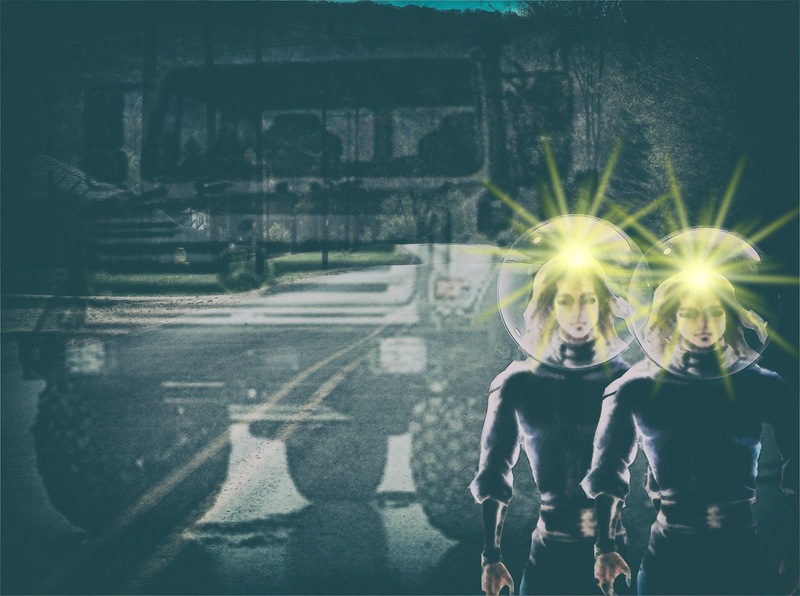 He told us about what he'd seen on the road, two people walking in brilliant helmets with lights on their foreheads. As the driver approached these beings, he realized they were out of the ordinary. Their height was in excess of two and a half meters (8 feet)." During another section of the interview, he was asked why Patagonia is the source for so many myths and reports in the field of ufology. He replied that Chilean and Argentinean Patagonia "are visited by an intelligence we cannot understand." "There are many cases in all over the world and each region reports beings of different shapes. These beings, who are tall, dressed and with lights on top, have been seen in Patagonia. We are linked to the subject of beings who appear underground. There's something going on with minerals, some sort of element they're extracting." 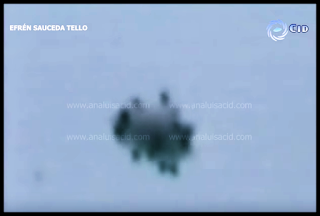 UFO Noise operates out of Puerto Natales and since 1997 it has researched cases and disseminated information on assorted eyewitness reports and experiences over radio and television. These range from sightings and pursuits [by UFOs] to possible encounters with the occupants of objects landing throughout the various geographical regions of the area. They have been in touch with AION (Agrupación de Investigacion Ovnilogica Nacional), the organization lead by the renowned national and international ufologist Rodrigo Fuenzalida with the aim of exchanging and analyzing film and photo evidence of cases that have found their way to the media. One of the country's most notorious UFO sightings occurred in Tucumán. The incident took place at the ranch of the Moreno family only kilometers away from Trancas. According to their story, they witnessed the descent of flying objects from the night sky on October 21, 1963 over the General Belgrano Railroad Line located only a few meters from the family farm. The craft emitted lights until they rose into the air anew and vanished in the direction of the Sierra de Medina. The event was investigated by the Universidad Nacional de Tucuman (UNT) and served as the inspiration for one of the scenes in Steven Spielberg's Close Encounters of the Third Kind. Jolié Moreno is the only living witness to the event, and remembers it all in spite of being 77. It was very cold that night. "Much too cold for October," says the woman, who was 21 years old at the time. Dora Guzmán, one of the family's maidservants, was about to wash the dishes after dinner and changed her mind, on account of the "strange lights outside the kitchen." It was then that Jolié's sister, Yolanda Moreno, who was asleep, woke up, threw on a robe, grabbed a .38 Colt and went outside the house with the servant to open the gate which led to the farm. Strange lights were visible over the Belgrano railroad tracks, only meters away, looking like "when a fluorescent bulb has gone out," Moreno explained. "There was a tube covering the entire track, and you could see the silhouettes of people walking from one light to another. The silhouettes could have been our own. One could see arms, legs and heads in the distance." Later, she said that when her sister wanted to turn on the flashlight to open the gate, a light "like flamethrower" knocked her and the servant to the ground, inflicting "first, second and third degree burns" to the servants face. "The gun wound up in the garden and my sister ran into the house, frantically screaming 'mother, father! Wake up! We don't know what's going on! '," Jolié recalls. The flying saucer that was near the garden and the ones on the track took off like a spinning top, she explained. "The siege lasted more or less 45 minutes. Then they issued another light that reached as far as Trancas. They went up, slid 80 degrees to the north, and that was the sign of their retreat to the Sierras de Medina, which were illuminated for two hours," she explained. "The Trancas Case represented a before and after, especially in those days, when talking about UFOs was considered deranged," reflects Carlos Burgi, a ufologist with Tucumán OVNI. "It's a landmark case because the craft were seen not only by the Moreno sisters, but also by their parents, the servant, and neighbors." 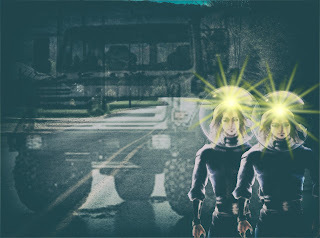 Furthermore, the alleged vehicles left some small white orbs and spots on the grass and the railroad tracks, Burgi adds. 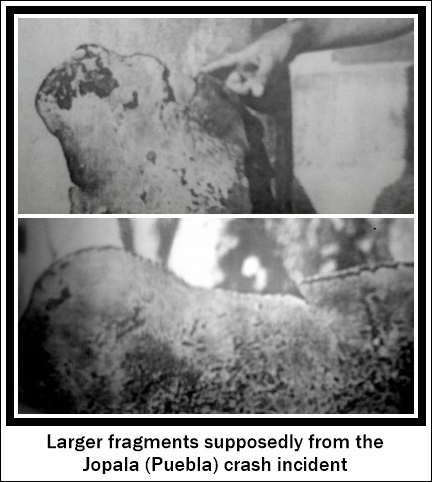 "The UNT came to investigate and analyze (one of the small orbs) which proved to be 98% pure calcium carbonate. What happened that October evening changed Jolié's life. "Not many have seen what I saw," she stated. A lively UFO symposium known as the Café Ufológico de Mendoza is held on a regular basis in this Argentinean city's Café Five Stars, representing a source of "real time" information exchanges among students and witnesses of the phenomenon. The most recent such meeting was held on September 27, 2017 and was joined by Raúl Díaz, Ariel Godoy, Daniel Hendryk, Martín Fuentes, Alejandro Asalgado, Laura Lencinas, Laura González, Mariana Muñoz, Cristina Rodríguez, Violeta Moreno, Fernando Rodríguez, Susana Occelli, Héctor Sawiak, Diego Escolar, Alejandro Rosario, Miguel Marinelli and our friend and colleague Luis Emilio Annino. 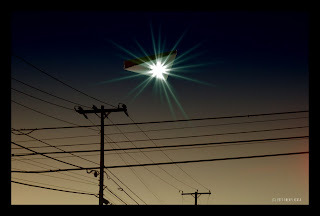 Among the cases presented for discussion was a compelling sighting of a triangular UFO in the mid-1970s. Mr. Annino writes: "First, we welcomed Cristina Rodríguez, who was accompanied by Violeta Moreno (both of them residing in the mountainous region of Potrerillos) and their brother Fernando Rodriguez. Having several surprising experiences to share, Cristina recalled a particular one from the spring of 1976, when she lived in a farm covering some six hectares in a rural region corresponding to Colonia Segovia in the Department of Guaymallen. Around 21:00 hours, while escorting her aunt, who was feeding a dog in another house, located 50 meters from the main residence, she beheld an incredible sight: A triangular flying object the size of a car and bearing three lights (red, white and blue) that came from behind the property, flying at the height of the surrounding poplar trees, which also lined a deep ditch. The flying object appeared to be flying over said ditch, almost vertically, tilting on its axis slightly as it progressed. The object had a peculiar feature: a sort of spotlight that swept along its path, as if looking for something. The aunt, frightened by this, fled the area while Cristina kept looking at the strange triangular object that suddenly turned itself off and vanished from her sight as it began entering a neighboring property near a high voltage tower. This was not her only experience, and Cristina will certainly say more about her unusual encounters in future meetings." Our thanks as always to Guillermo Giménez for the information. Our friend and colleague Alfonso Salazar, a UFO researcher and aviation expert whose accounts have been featured over the years, shares with us these vintage photographs from the defunct Contactos Extraterrestres magazine. "The incident took place on July 29, 1977, when a UFO crashed into the Puebla mountain range. The Mexican military conducted a search and photographs of the object's remains were displayed for the first time," writes Mr. Salazar, who is working on a book about this fascinating moment in history. Mexico: A Mothership Over Nuevo León? [The percipient] was driving his car when his niece Claudia called his attention to something she could see. He pulled over to begin recording. After 15 minutes, the smaller figures were gone and only the larger one remained, although somewhat hazy. The witness looked into the possibility of some local major event involving a release of balloons, but found nothing. "I conducted my own research and could not find any sources, yet this possibility cannot be dismissed altogether. The sighting took place on September 5, 2006. I'm only just publishing it it now since the tape had been lost along with other materials." 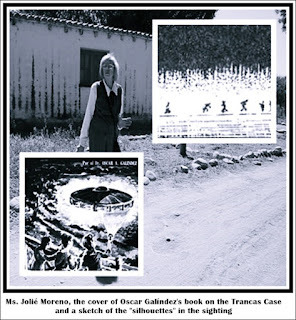 Each year, on October 7, the residents of the Paihuano commune recall one of northern Chile's most significant and controversial UFO events: the alleged UFO crash against Cerro Las Mollacas. This mysterious event began on the hot afternoon of 1998 when many witnesses claimed having seen a silvery object colliding only meters away from the summit of this mountain. From that moment onward, numerous witnesses were interviewed by local and national media and some UFO researchers from the capital city allegedly saw a strange glow on the slopes of Las Mollacas. Raul Flores was among them. He said he had never seen anything so strange before. "I could see the object on the mountain. It resembled a metallic disc reflecting the sunlight with a glint of metal. Others saw it as well. I'm sure of what I saw. It wasn't the sun shining against rocks or anything similar," he explained. Marco Antonio Gallardo, a well-known broadcaster, said the object "[approached the summit] with smoke, it was cylindrical and measured some 3 to 4 meters in diameter, and was red in color." 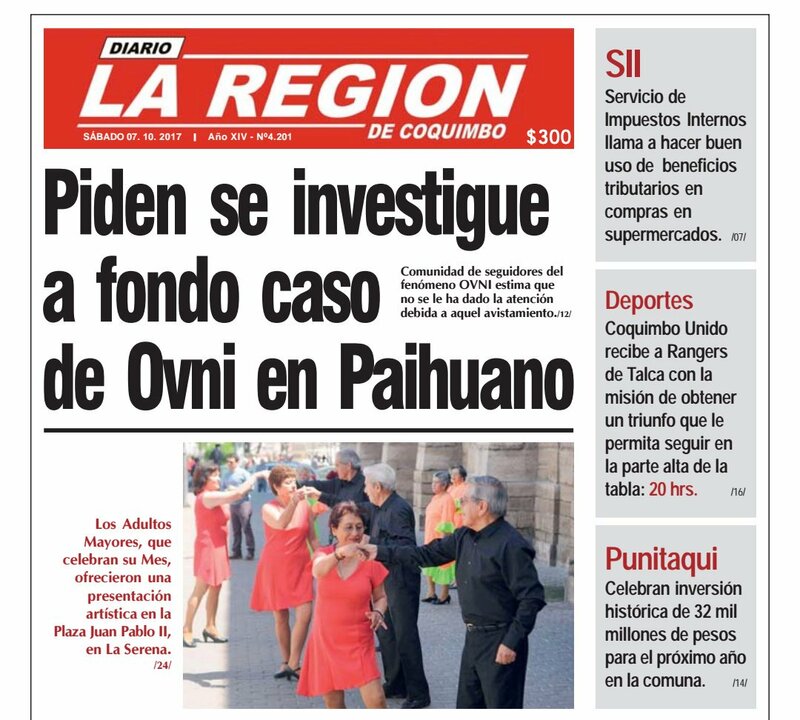 On October 9 of that year, a group of civilians and Carabineros officers from the Paihuano barracks reached the site without finding remains of the object or any abnormalities. The place where the UFO allegedly crashed is hard to reach and the trip takes nearly six hours. The Carabineros reached the site again the following day, this time accompanied by personnel from the Serena PAE and according to some witnesses, also by elements from the GOPE (Special Operations Group) based in Santiago. A horse called 'Calambrito' died as result of the strain. This was confirmed by Cesar Uribe, a retired Carabinero who now lives in the commune of Coquimbo. Nothing was ever found in the vicinity. However, there was much speculation about the presence of the Chilean army in the area. There was also talk of helicopters or heavy trucks that ascended to the location through the rear of Cerro Las Mollacas. The first official explanation delivered was that a "stone pained white" was involved. This was immediately rejected by all witnesses, since many had lived in the area for many years and had never seen such a stone. The other explanation was offered by the Cerro Toledo observatory. Arturo Gomez, an astrophotographer, noted: "Everything points to a bolide, that is to say, a meteorite that did not strike the Earth's surface, but rather broke into pieces in the upper atmosphere, accompanied by a loud report and brightness." 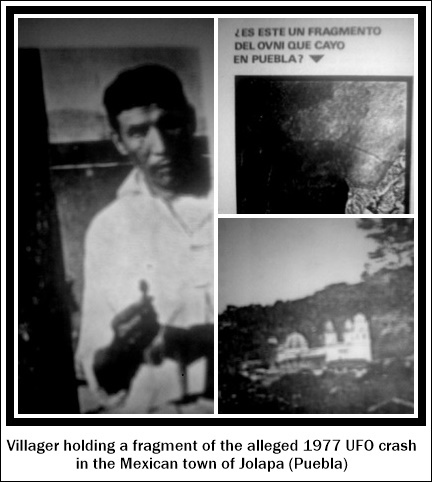 Gomez further added that he "fully rejected the possibility that the object that exploded over the Vicuña commune could be a manmade craft, such as space junk, since these devices do not explode or produce light due to their reentry speed. They burn up without further ado." Journalistic activity did not stop for many years after the incident on October 7. Correspondents for television stations and live reports were the norm. Many tourists also visited the area, drawn by the story. The interest shown by researchers of the phenomenon caused the communal authorities to issue a decree devoting a week in October to popularization activities on the mystery in local schools and cultural institutions. 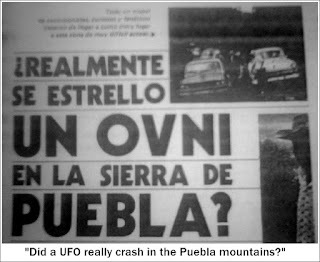 Now, 19 years after the event, Juan Castillo, one of the country's foremost researchers and the author of several books on the UFO subject, told LA REGION that the case should be reopened to carry out a more thorough investigation into the Cerro Las Mollacas event.